Rose scented pelargonium essential oils (geranium oils) are wellness scents that evoke calm and tranquility and is used more than any other in aromatherapy and spa-therapy. The essential oils in scented pelargonium leaves (very used being Pelargonium Graveolens cultivars) has similar constituents as the rose oil: citronellol, geraniol, linalol, but the basic rose scent has a range of tones from sweet eucalyptus or cloves to lemon or minty-green and are used also in cosmetics and perfumes industries. One type of geranium oil, known as Bourbon Oil, has established itself as a premium perfume oil , his consistency being thin and color ranges between golden brown and emerald green. This greenish-olive liquid with a rosy-sweet, minty scent, blend a wide array of aromas: lavender, patchouli, clove, jasmine, juniper, basil, bay, citronella, cedarwood, sandalwood, grapefruit, lime, orange, rosemary, bergamot and citrus oils. Is renowned for its actions: anti-inflammatory, anti-hemorrhagic, antiseptic, astringent, cicatrising, deodorant, antidepressant, fungicidal and tonic and is used in: skin care: acne, congested skin, dermatitis, eczema; in ulcer and wounds treatments; in poor circulation and cellulite improvement; in respiratory problems as expectorant; in aromatherapy as a promoter of balance and stability. 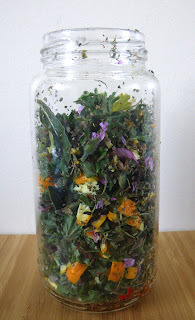 In a bowl mix well lavender flowers, basil leaves rosemary leaves and scented pelargonium leaves finely crushed, then cloves, small cubes of orange peel and sweet bay leaves. Pack a wide-mouth jar with this mixture. Add olive oil to cover the plant material, mix gently and check to make sure the oil really penetrates and covers all of the leaves in the jar. Label the jar with the day you started the infusion process, and set it in a pan in a sunny, warm spot for at least two-three weeks. 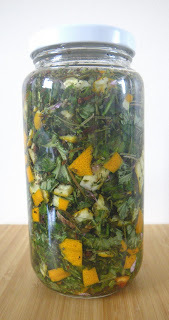 Strain the oil into a bowl through cheesecloth then pour it into clean, dry bottles. Label the bottles with their contents and bottling date, and keep out of direct sunlight. The strained mixture can be also used to make bath sachets. Place two tablespoons of strained mixture into muslin bags, then seal the bags with rubber band or ribbon. Hang one bag of herbs around the faucet—just make sure that is under the stream of water—then fill the tub with hot water. You can also place the sachet into a bathtub as it is filling and soaking in an herbal bath for at least 20 minutes. Freeze the sachets for long-lasting usage. The herbs used in recipe will stimulate your senses and leave you feeling delightfully refreshed, relaxed, and invigorated. Also the oil will soothe your skin, relax your muscles and stimulate the circulation. You can make your own Bourbon Oil with plants organically grown by yourself, then you can use it for few months as a massage oil or in bathwater and aromatherapy diffuser. Love this essential oil post - I travel with a "first aid" kit of lavender, peppermint, tea tree, and eucalyptus. Missed the geranium and lemon oils this trip though. Author Deborah Dolen’s “Do It Yourself” books have helped us to save money on making lip balms, lotions, soaps, candles and more. There are over 20 books with several instructional videos under her Mabel White Home Living label, much of this is available online. Thank you all for your kindly comments and suggestions. Dear Xenia, our "research department" is looking for a solution. ;-) Stay tuned! This sounds wonderful. Thank you for the recipe. I am hopping in from Friday's hops. Have a wonderful weekend! Would love for you to stop by. 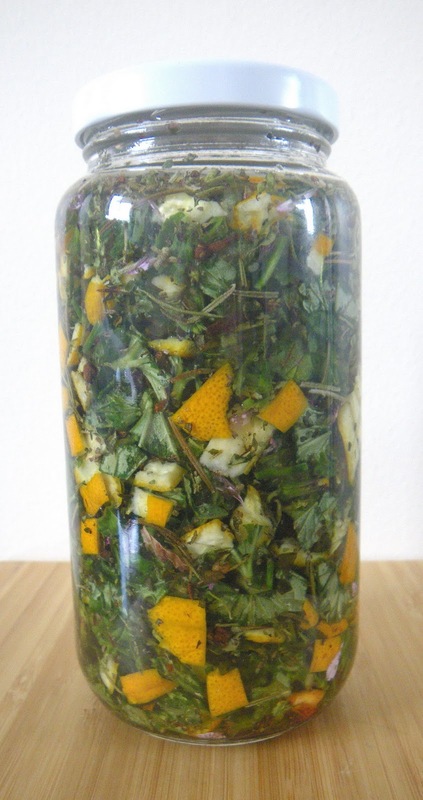 A good recipe of the leaves and nuts infuse oil. Leaaves infuse oil may be greenish odur present in the solution. And Infuse oil life is short days duration.